INKSYSTEM™ is an internationally known trademark, represented by USA based company with 31 offices in the USA, European Union, the United Kingdom, China, Hong Kong, Japan, Russia, Ukraine and about 240 dealerships with over 600 sales points all over the world. We are a leading global player in the market printers who keeps pace with sustainable growth of the market. Our dealership network grows day by day globally owing to our high quality products, our concern for partners and round the clock support of their business. 2005 – INKSYSTEM™ trademark was registered. The Headquarters and the Product Development Centre was placed in New York City, where our core product – the Continuous Ink Supply System by INKSYSTEM™ was designed. 2006 – Global market reviews showed the highest growth rates of the CISS market in the Former Soviet Union countries (FSU countries). We went into immediately and founded an International Sales Company (Commonwealth of Independent States) in Moscow, Russian Federation. 2007 – Product Development Centre developed Ink formulas by INKSYSTEM™, which were the most suitable for continuous use and didn’t spoil the printing head. The production of the ink was placed in South Korea. – The number of new dealerships and sales amounts required separating the National Sales Company servicing Russia founded in St. Petersburg and the National Sales Company servicing Ukraine founded in Kiev. The Logistics Office for European and FSU Countries was founded in Odessa, Ukraine. 2008 – Product Development Centre designed the Photographic paper by INKSYSTEM™ with production placed in South Korea and Refillable Cartridges by INKSYSTEM™ with production located in Shenzhen, China. – In order to enhance our internet sales results all over the world we founded the IT-Support Office Global in Kharkov, Ukraine. 2009 – On-Line Service Tutorial Program for dealerships started and YouTube Video channel with over 50 instructive video clips opened, in order to make the learning process easier and accessible for dealerships with distant allocation. 2010 – For the purpose of enabling the highest support level for our European partners we opened Sales Department European Union in our Kiev office, Ukraine. – National Sales Company Belarus founded in Minsk. – National Sales Company US founded in Las Vegas, Nevada. – New authorized service and stock founded in Kazakhstan. 2011 – Authorized representatives in Czech republic, Bulgaria, Ireland, Kenya and Portugal opened. – National Sales Company and stock founded in Warsaw in Poland (which made INKSYSTEM™ products more affordable for customers, and gives a lot of benefits to INKSYSTEM™ partners in European Union). – Stock INKSYSTEM in the USA, Nevada, Reno opened. 2012 – Authorized representatives in the United Kingdom and Germany are opened. – “Ready solutions policy” (Inkjet printer+CISS) was implemented. It helps INKSYSTEM™ win the confidence of our customers and therewith the major part of the mature CISS market of the FSU countries. 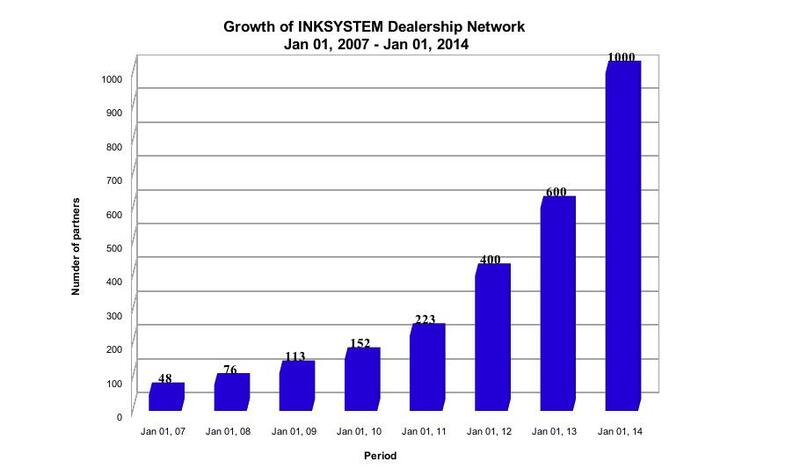 2013 – INKSYSTEM™ represented by 25 authorized sales companies. – National Sales Company Japan founded in Yokohama. – Stock of Printers, CISS and ink founded in Hong-Kong. 2014 - INKSYSTEM™ established a long-term partnerships in Southeast Asia. 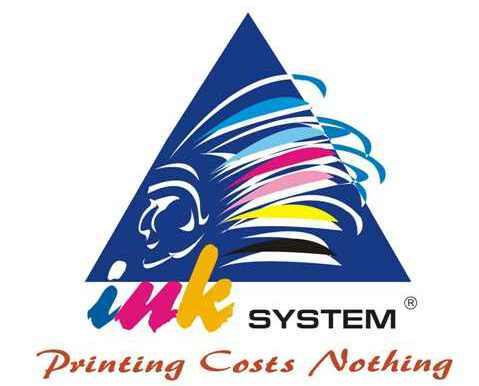 According to the market final analysis of 2012 and 2014 INKSYSTEM™ is the leader in sales of alternative consumables in FSU-countries and one of the leaders worldwide. INKSYSTEM Company cooperates with regional retailers on terms of a distributor or franchising agreement. That means that the franchise business with INKSYSTEM™ is a free of charge business model with the well known trademark, high quality products, technical support of head office and a bundle of additional advantages. We share our experience how to develop sales units and wholesale network and how to maximize sales volumes of our partners. Our interest and value is the engagement and desire of our partners to deliver our consumers best products and best service level for their economy and full satisfaction. This brings our good reputation, increases demand for products of our trademark and lets us grow day by day. If you are interested to start business with our company, please fill in the form, and our managers will contact you.